The Exorcist is one of the greatest horror films of all time and a personal favorite of mine. But what about Exorcist II: The Heretic? Well, it would be a bit of an understatement to say that The Heretic has not quite received the amount of critical acclaim as the first film. 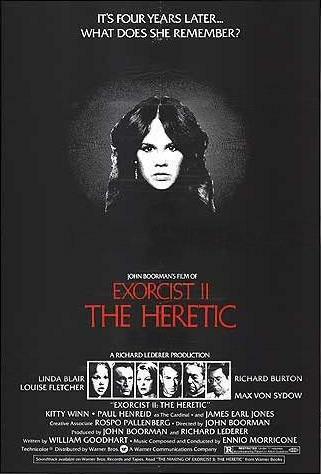 Since it was first released in 1977, The Heretic has been widely considered to be one of the worst sequels of all time. It’s a film that is often cited as evidence as to why not all successful films need a follow-up. Myself, I have sat through The Heretic twice. And yes, it is a pretty bad film but I have to admit that I enjoyed it each time that I saw it. It’s not a scary film at all. It’s not a successful horror film. But, as an unintentional comedy, it’s hilarious. Well, it gets a little bit complicated. That’s one of the big differences between The Exorcistand Heretic. The Exorcist kept things relatively simple. The Heretic drags in a lot of metaphysical argle bargle. The deceased Father Merrin has been brought up on charges of heresy. The Cardinal (Paul Henreid, many, many years after Casablanca), assigns Father Lamont (Richard Burton) to investigate the circumstances surrounding Father Merrin’s final exorcism. The presence of Richard Burton is what elevates Heretic from merely being bad to being so bad that it’s good. As written, Father Lamont is supposed to be something of a naive idealist, someone who never met Father Merrin but who has been intrigued by his writings. Reportedly, several youthful actors turned down the role and eventually, production decided to make Lamont an older man and they ended up casting Richard Burton. Speaking in a shaky rasp and staring at the camera with bloodshot eyes, Burton appears to be at the height of his famous self-loathing in this film. Burton is so miscast as an idealistic priest that the film becomes fascinating to watch. Occasionally, the film tries to make us suspect that Lamont himself may be possessed but with Burton snarling his way through the role, how could anyone tell the difference? Lamont tracks Regan down in New York. Regan doesn’t remember a thing about the exorcism and appears to be an overly happy teenage actress. (A good deal of the movie is devoted to her rehearsing a big dance number.) She is under the care of psychiatrist Gene Tuskin (Louise Fletcher). Tuskin has a device called the Synchronizer. When two people are hooked up to it, they can literally see into each other’s minds. They can share the same memories. They can … wait a minute. What the Hell? The Synchronizer essentially appears to be little more than a blinking light but it can actually allow you to enter into someone else’s mind? Doesn’t that seem like that should be a big deal? Through the use of the Synchronizer, Reagan, Lamont, and Tuskin get to watch a lot of scenes from the first Exoricst. It also allows Father Lamont to have visions of Africa and another exorcism, this one involving a young boy named Kokumo. This leads to one of my favorite parts of the film; Richard Burton wandering around a dusty African market and randomly telling people, “I am looking for Kokumo.” It turns out that Kukomo has grown up to be a doctor and he’s now played by James Earl Jones, who appears to be amused by his dialogue. Also showing up in the film’s Africa scenes is Ned Beatty. Beatty plays a pilot who flies Lamont to Kokumo’s village. “Have you come here before?” Beatty asks. “Once … on the wings of a demon,” Lamont replies. The first Exorcist worked largely because William Friedkin directed it as if he was making a documentary. John Boorman takes the exact opposite approach here, trying to turn a cheap sequel into a metaphysical meditation on good, evil, and nature. It’s amazingly pretentious and it would actually be rather annoying if not for the fact that Burton doesn’t make the slightest bit of effort to come across as being in any way emotionally or intellectually invested in his over-the-top dialogue. When you combine Burton’s overwhelming cynicism with Linda Blair’s nearly insane perkiness, Louise Fletcher’s genial confusion, and James Earl Jones’s cheerful humor, the end result is something that simply has to be seen to be believed. So, yes, The Heretic is as bad as you’ve heard. But that doesn’t mean you shouldn’t watch it.